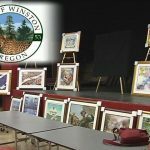 WINSTON, Ore. (NRtoday.com) – An internationally known artist has donated a painting to the city and redesigned the city’s logo. The colorful abstract painting by Dominic Pangborn was unveiled Monday at a Winston City Council meeting. Pangborn, a Michigan resident, was present at the unveiling. He said he was born in Korea and in 1962 came to Jackson, Mich., a city very similar in size to Winston. “It was almost like walking into my own hometown,” Pangborn said of arriving in Winston. He become interested in Winston after meeting Winston Mayor Rex Stevens and his wife, Gail, in September. The Stevenses have been collecting art since 2005. “I think we hit it off,” Pangborn said. “I took a real deep curiosity (in) this Winston.” As a result, Pangborn has redesigned the city’s logo. On Monday, he remembered asking city officials of the previous logo, “What’s this cat jumping over the pile of pine trees?” “It’s not a cat, it’s a cheetah. It’s not a pine tree, it’s a Douglas fir” he was told, Pangborn recalled with a smile. An illustrator who has designed logos for Fortune 500 companies, Pangborn persuaded city officials it would be more appropriate for the cheetah to be looking through, rather than flying over, the trees, Rex Stevens said as he held up the new logo. Stevens said he hopes the city will soon start incorporating the logo into its letterhead and other city materials. About two weeks ago, he created the colorful painting unveiled Monday. Partially obscured by the abstract nature of the work, the face of a tiger glares at viewers. The painting will be hung in the Winston Community Center, Stevens said. Pangborn’s visit was part of an all-day event prompted by a recent gift. The chief executive officer of a Michigan-based art gallery donated 20 pieces of framed art and a set of art books to Douglas High School. Albert Scaglione, CEO of Park West Gallery, offered the works of art to the city after meeting the Stevenses in September. Park West Gallery, which has galleries in Michigan and Florida, has donated art and art books to communities in those two states and throughout the world. A ceremony was held Monday morning at Douglas High to accept the paintings and serigraphs. After the ceremony, Pangborn spoke with art students. To learn more about Pangborn, visit www.pangborndesign.com.